These two challenges combined result in Water & Wastewater sites that are manned by less and less people. For some small and medium sites, this may even mean that they have no maintenance personnel on site at all – only a few operators remain and sites share “nomad” or remote maintenance personnel that roam between different sites which may be as far as hundreds of kilometers apart. What happens when you have no maintenance people on site and you experience a failure somewhere in your water network? It might be small issue that can be fixed easily, or it might be a big issue that could potentially last a long time and cause significant downtime. Either way, any type of failure is problematic. Well, what if you had a DCS that, in the case of process failure, allows the first level of diagnostics and repair to be performed by your operators? This is instead of those who are usually called on for this task – your maintenance personnel. 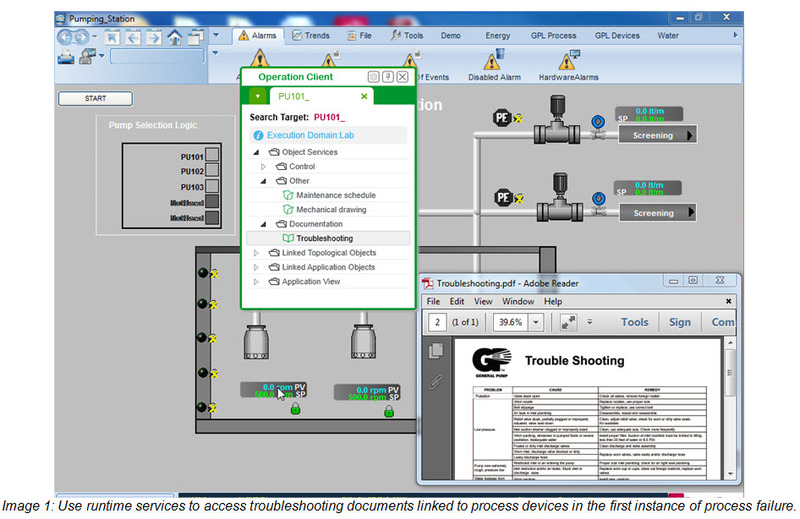 Using the real-time navigation services in such a system allows an operator to access troubleshooting documents that are linked to each device in your process (see image 1). 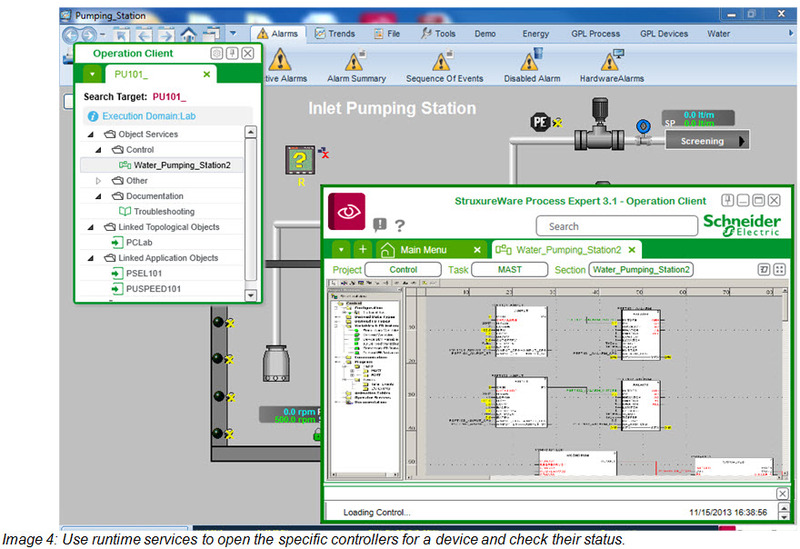 This means that by using navigation services to select, for example, the pump with the failure warning, an operator will be able to access any type of document that is relevant and dedicated to the failed pump. In this example, the operator accesses a troubleshooting document that will help him perform the first level of diagnostic repair without the need to contact his maintenance person who, if you remember, might not be onsite when the failure occurs. So if this is a simple problem and the troubleshooting document helps the operator repair the failure, then you have saved time (for operators and maintenance people) and money (cost of downtime) by using real-time navigation services. However what if this is a more complex problem that needs the attention of a more specialized maintenance person? Well when the maintenance person comes to investigate, the same navigation services with access to specialized documentation will be available to them. In addition, maintenance personnel can also be set up with different access levels and so will be able to find more detailed information on different process equipment. If we continue our example with the pump, an element of the pump may be broken, so by selecting the pump within the navigation services a mechanical drawing or electrical drawing of this pump can be opened – providing the maintenance person with a lot more detail to help fix the problem (see image 2). Real-time navigation services also allow a user to “dock” any document they are using. Continuing our scenario, our maintenance person can navigate directly to the maintenance schedule of the pump and check all the historic data for this pump (see image 3). By doing this, he can check if something abnormal was detected in any previous maintenance runs, which could have led to the actual failure he is trying to resolve. Additionally, using this log might also show some other information that was captured during the last maintenance check, which may also help him to diagnose and repair the failure. It’s about getting the right information, to the right people at the right time. And with real-time navigation services the system does this for you. 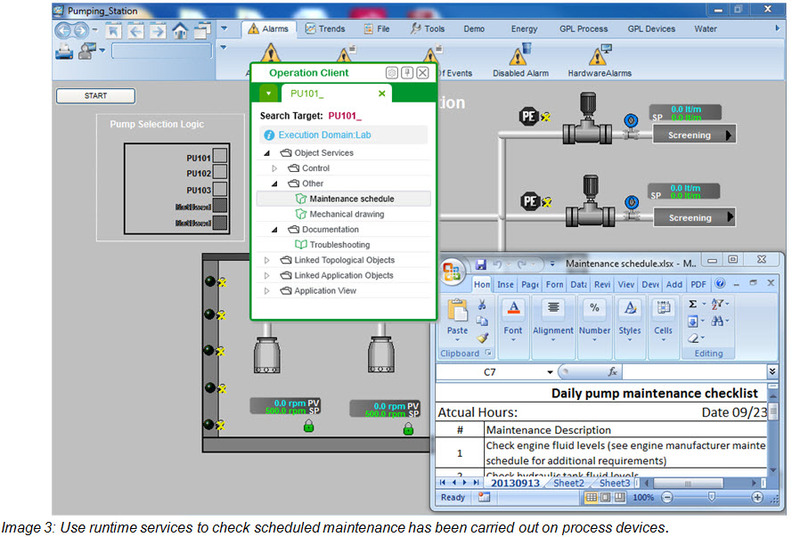 Real-time navigation services will also allow a maintenance person to open the system’s controller application (even while the system is running) at the specific point in the process where the pump is located (see image 4). In case the failure is not being caused by the pump itself, but is due to a logic combination in the controller, embedded and online access to the code for the pump through the navigation services is another way to speed up diagnosis of the failure. In addition, more time is saved and diagnosis made easier by not needing to find, from inside a very big application, the piece of code that directly relates to the specific pump – navigation services takes care of it. Another benefit that is also very important is reducing mistakes – by going directly to the code for the correct pump no changes are made to any other pumps, or other equipment, by accident. In conclusion, I have shown you four different ways that real-time navigation services for a DCS can help you improve failure response times – with a specific Water & Wastewater application. 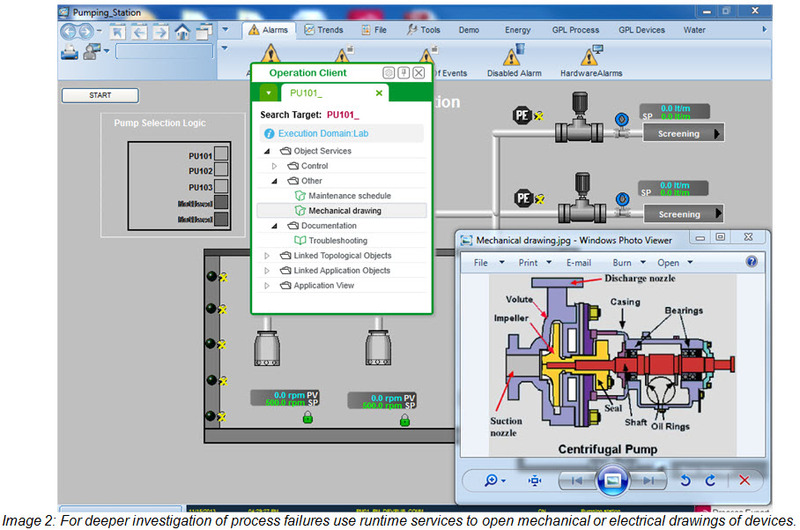 By supporting operations and maintenance personnel to quickly investigate and fix a process failure, real-time navigation services bring a very real increase in operational efficiency for process applications and, at the same time reducing system total cost of ownership and ensuring ensure possible process downtime is reduced as much as possible. How do we cope with the dwindling talent pool in Water and Wastewater? 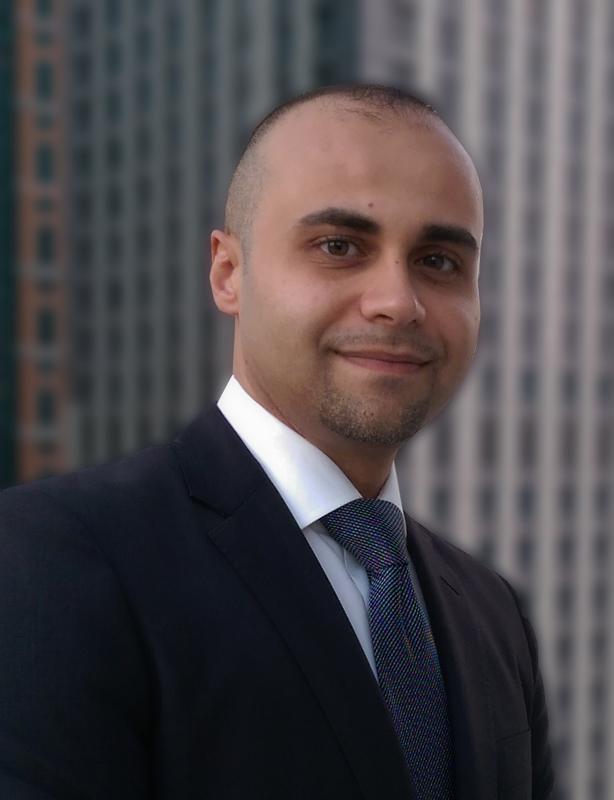 How “Intelligent Pumping” strategies address disruptive trends in Water Wastewater Industry City of Atlanta Nominated for Top Water and Wastewater Project Hackers are After Your Water and Wastewater Network – Big or Small!